How do I register with the Adoption Reunion Registry? What happens after I complete and submit the registration form? How do I change, update or alter my registration? How is my registration matched? How do I search the registry and what if I find a possible match? Should I inform the registry that my registration has been matched or I found the person I was looking for? How many people sign up on the registry each day? I have a question or need help, who do I talk to? Go to the registration page and start the registration process. When you complete this first section, clicking the "Continue" button takes you to the "Update your Account Information" page where you provide your contact information. Click "Save Changes" to complete your registration and you can now add who you are searching for. In the "Relationship" section use the pull-down menus to select who you are and who you are searching for. Click the "Add Adoption Info" button and you are taken to the page form where you fill-in the details you know about this relationship. The more details known increase your chance of being matched. You are entering information that is placed directly into the Adoption Reunion Registry Database. Please double-check what you are entering for accuracy. After you have entered all the information you know about the adoption, click the "Add to Registry" button to enter the record into the Registry about the person you are searching. If you are searching for more than one person, repeat the steps in the "Relationship" section described above to add another search record into the Registry. Once you complete your registration and add at least one person you're searching for, the information you entered is placed directly into the Adoption Reunion Registry Database. An email confirmation will automatically be sent to your email address for your records. To increase the chance of a match to your Registry record(s), periodically log in and update your information to ensure its continued accuracy. How do I change, update or alter my registration information in the Adoption Reunion Registry? This is an on-line interactive registry where you can update your information whenever it changes; such as new contact information (email address, phone number, etc.). A new married last name is especially important to update. If you obtain additional information for the adoption case, you should update the record as well. Click on the "Login" button and login with your email address and password and you are taken to the "Update your Account Information" page. On this page you can update your contact information, add another person you are searching for, and update the information about the people previously submitted you are searching for. "Your Current Information" section is where you update your contact information. If this is all you are updating, click on the "Save Changes" button in this section. You can add another search relationship by completing the "Searching for someone else? Add info for another adoption:" section. The people you are searching for are listed in the "Records in the Registry you have submitted" section, each with their own record ID. The information you listed for each record can be viewed in text format by clicking the magnifying glass on the far left of the ID number. If you wish to update and/or add new information for a record, click on the pencil on the left of the ID number and you will be taken to the "Update your Info for Record #" page for this record. Make the updates and/or add new information and click the "Save Changes" button. When you click the "Save Changes" button at the bottom of the page your updated and/or new information is entered directly into the Adoption Search Registry Database. You will receive an email confirmation automatically. NOTE: If you registered before November 2008, the email address you gave is also used as your password and can be changed once you login. If you need help, contact me instead of re-registering. When you register your information is automatically compared to all registrations in the database. If a possible match is found, it is forwarded to me for verification. I will do research to see if there is a match or not. If I find that your registration is matched, I will email you with the contact information for your match. Also, others searching the Internet for matches will search our registry and let me know if they believe you are their possible match. Again, I will do verification research. 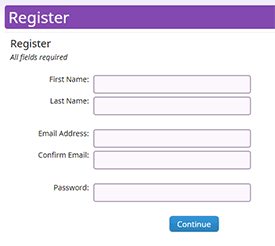 Log in to the registry using your email address and password. Click Search in the left-side navigation to go to the "Search" page. Select the criteria you wish to search for from the drop downs. Also, you may enter any part of the birth name, adoptive name, or registrant's name in the text boxes. After clicking the "Search" button, the "Registry" search results page is displayed. You may further modify your search with the "Search Critieria" box to the right of the results. If you feel you have found a possible match, click on the registration number and an email will be sent to me. As a "search angel" I will try to verify the match free of charge and correspond to you what I find. If you do a search and find a possible match without being logged in, clicking on the registration number of the possible match will prompt you to login. After you log in an email will be sent to me of your possible match. If you don't have a login, click the "Click here to Register" link. Upon completion of your registration, an email will be sent to me of your possible match. Should I inform the registry that my registration has been matched or I found the person I was looking for and have been reunited? Definitely! This is important so the database can be as accurate as possible so others can be matched more readily. Log in, go to "Update your Info", and then click to edit your record in the registry. At the bottom of the edit your page check the checkbox in the "Status of Search" section to indicate you have found who you were looking for. Complete this update by clicking "Save Changes". How many people sign up each day? What is the growth rate of the Adoption Reunion Registry? Since its launch on Dec. 17, 2008 the Adoption Reunion Registry has grown by 1313.97%. Based on the past 3,774 days of registrations, the site is experiencing a daily growth rate of 0.07% in new users, receiving an average of 25 new registrants each day. In the last 30 days there have been 773 new registrants in the registry. In the past 24 hours there has been 30 new registrants in the registry. If you have a question or want help contact me here.